"We are six weeks into an approximately eight-week demolition process, consistent with LPC-approved permits issued in December. The entire space is beyond restoration with the majority of the lobby’s features now removed. This renovation work is in accordance with our plans to revitalize 550 Madison, making it viable for multi-tenant occupancy." Through the spokesperson, Laurie declined to elaborate on repeated requests to give details on whether the floors, fixtures, and interior partitions had been demolished per the permits for the $100,000 project that were issued in December. Architect Scott Spector, principal of Spector Group Architects, is signing permits for this phase of the lobby project. Given the developer's reluctance to share details on the state of the lobby, the community board is trying to determine the exact scope and scale of the demolition-in-progress. "Until we know it is not correct, we cannot take any information as fact until [the board] can verify it," CB5 Landmarks Committee Chair Layla Law-Gisiko said. "If we were to find out that it was a misrepresentation, it would be very disappointing and worrying. We're always trying to work in good faith with all the stakeholders." 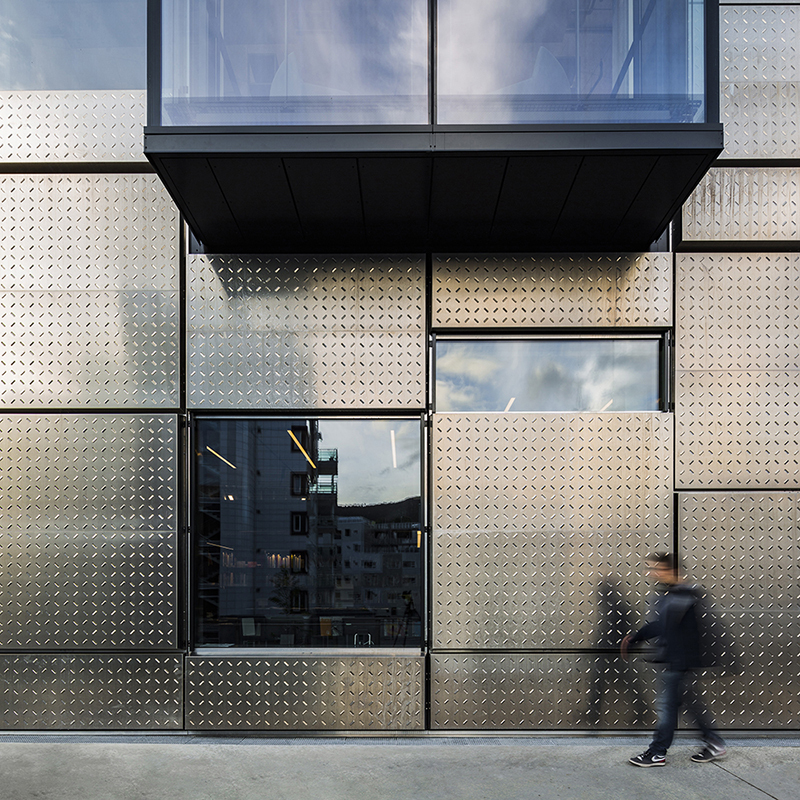 She added that the board knows the building must be altered to prepare it for multi-tenant occupancy, but that the alterations must be contextual. 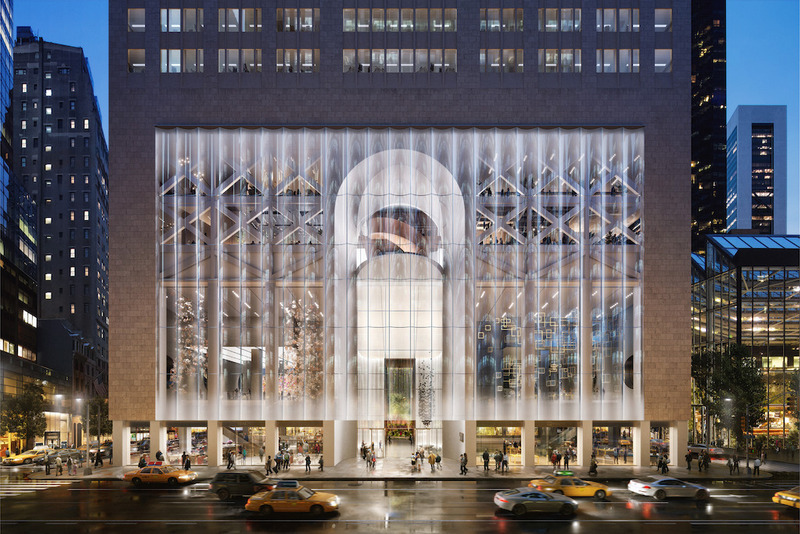 "Putting Philip Johnson's architecture in the dumpster? No," she said. At the full CB5 board meeting last week, members approved a resolution in support of landmarking, and encouraged the LPC to review the lobby as-is for potential interior landmark designation. The resolution also recommended reverting the public spaces Sony (the primary tenant after AT&T) had converted to retail in 1993 back to public use. Although community board decisions are non-binding, the LPC takes them into account in its deliberations. In addition to CB5's voice, five local politicians signed a letter to Laurie urging the development team to "engage in a good-faith dialogue" with preservationists and others to make sure the renovations honor Johnson and Burgee's original design intent. The undersigned—two state senators, two assembly members, and new City Council District 4 rep Keith Powers—said they understood the lobby wasn't up for landmark consideration, but encouraged Chelsfield and Olayan America to treat the space sensitively nonetheless. 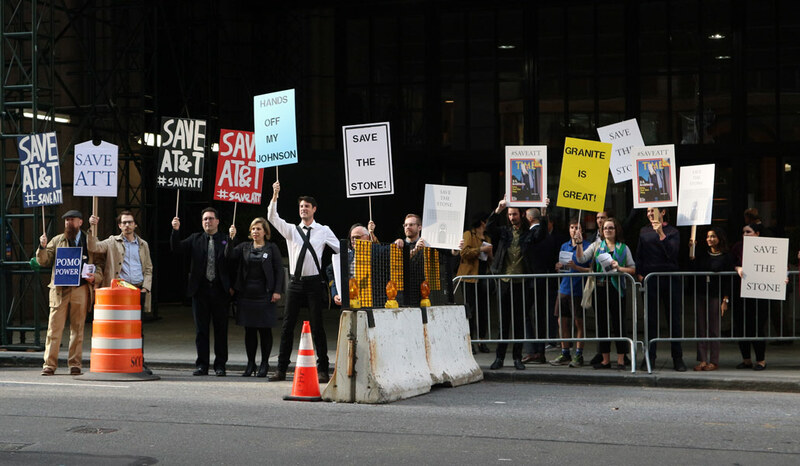 This latest controversy is an aftershock from the October reveal of Snøhetta's renovations, which sought to replace 550 Madison's imposing pink granite facade with an undulating glass curtain wall that would expose the 37-story tower's steel framework. The $300 million redo was met with an avalanche of criticism, with some architects and pomo enthusiasts taking to the streets to protest the planned changes. Collins took the lead on the landmarks nomination, preparing the LPC paperwork for the building's nomination. 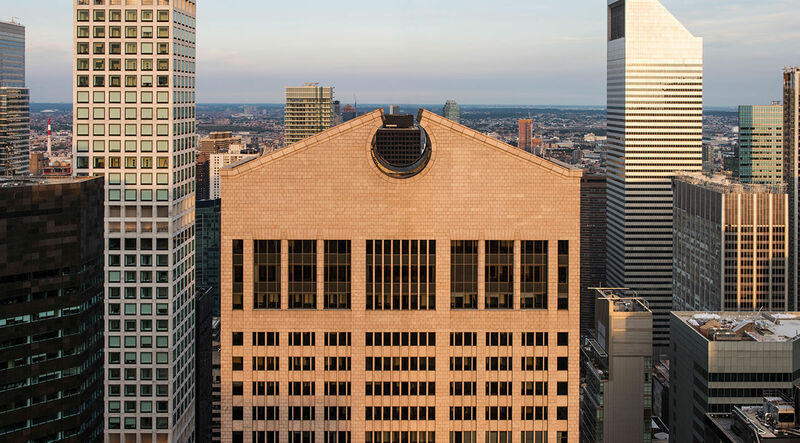 These are the first major changes to 550 Madison, as the building is now officially known, since Olayan America acquired the property for $1.4 billion in May 2016. Since last February, records show the owners have paid two lobbying firms over a quarter-million dollars to attempt to influence the Manhattan Borough President, the Department of City Planning, and various council members—not an unusual move for a development of this caliber. This year, the group has retained the lobbyists at Kasirer to speak with the Manhattan Borough President, the Department of Buildings, community boards, and the LPC, among other entities. Records show the group, working as OAC 550 Owner LLC, has spent no money so far in 2o18 on these efforts, however. An AN reporter went to eyeball the lobby on February 2, looking for possible changes. Whereas it was previously possible to see into the space through cracks in the butcher paper, workers have taped the cover-ups to the glass so thoroughly that none of the lobby is visible from the street. For his part, Collins believes the permits are for preemptive demolition. "They don't have a plan for the interior; they just want to mess up enough of the interior so the LPC won't touch it," he said. 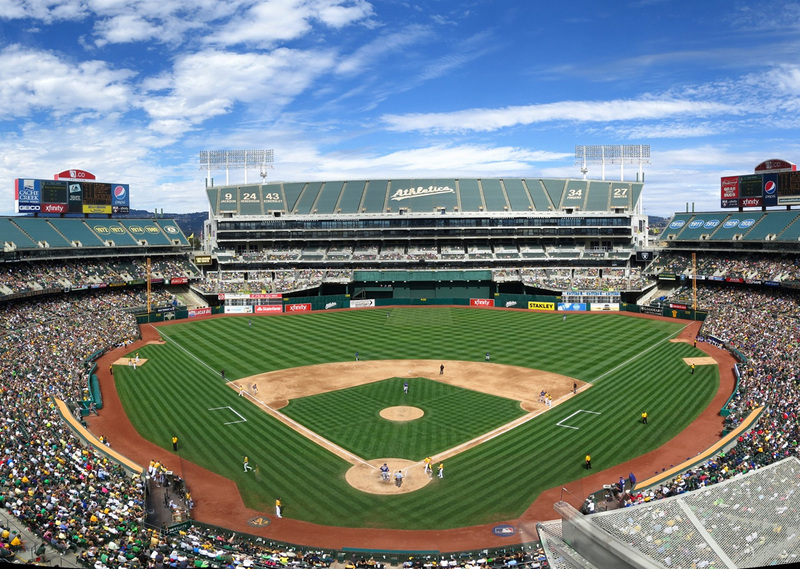 This story has been updated to clarify the scope and impact of the interior renovation. "All work being performed is in accordance with appropriate permits and approvals, and is being reviewed by the NYC Landmark Preservation Commission, which is not considering the interiors as part of the designation process. 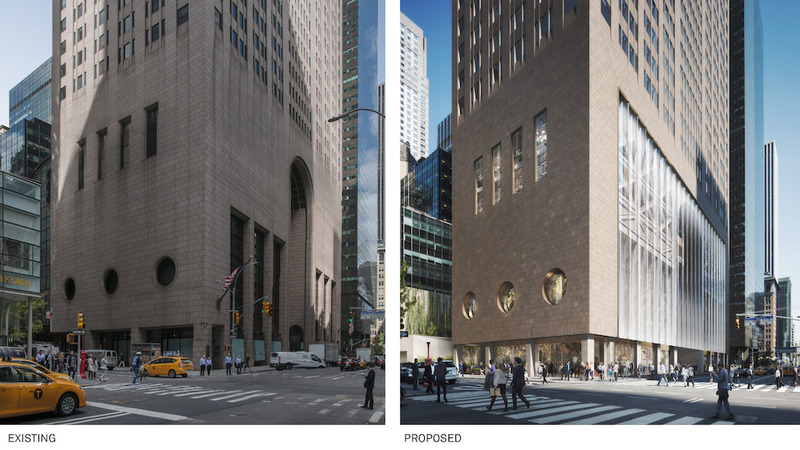 We support the designation of the building and are currently preparing a carefully revised design that respects 550 Madison’s importance, and we look forward to continued discussions with interested parties, including the LPC, to make that happen. 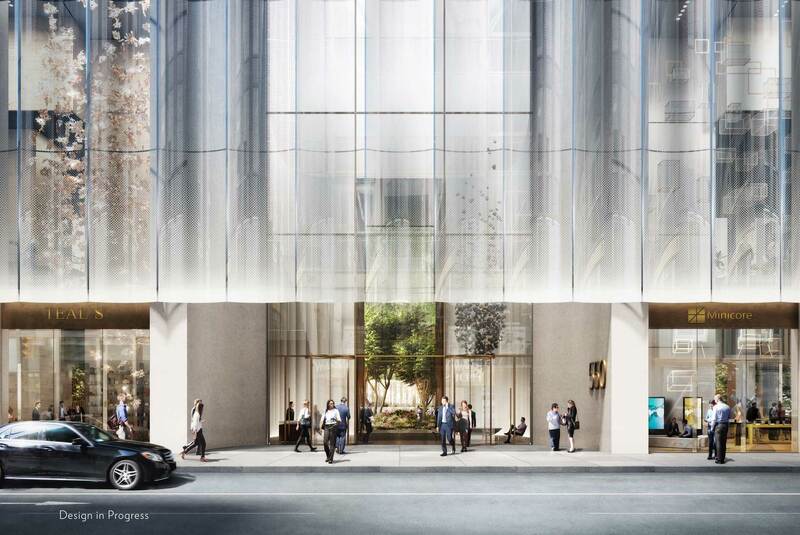 We are committed to creating a rejuvenated 550 Madison that retains its important presence, works for modern office tenants, and dramatically improves public spaces and amenities available to the larger East Midtown community." Unsurprisingly, the surprise demolition didn't please preservationists. "The LPC made this decision behind closed doors—they knew they were going to rip out the interior," said Liz Waytkus, executive director of Docomomo US. "I feel like it's a bait-and-switch." This would not be the first substantial change to the structure. In 1993, electronics giant Sony commissioned Gwathmey Siegel Kaufman to convert the loggias on either side of the main entrance into retail, and enclose the open arcade at the building's rear. Johnson served as a consultant on the project. The 550 Madison team promised extensive community outreach on the project, but aside from the Landmarks hearing, no public community meetings have been scheduled so far. 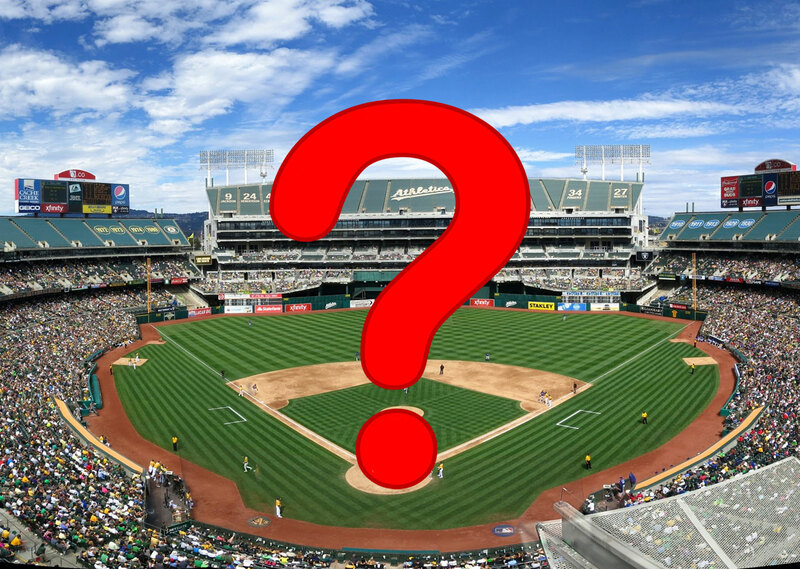 When prompted, a spokesperson for the developers did not volunteer specifics on the forthcoming community outreach efforts. 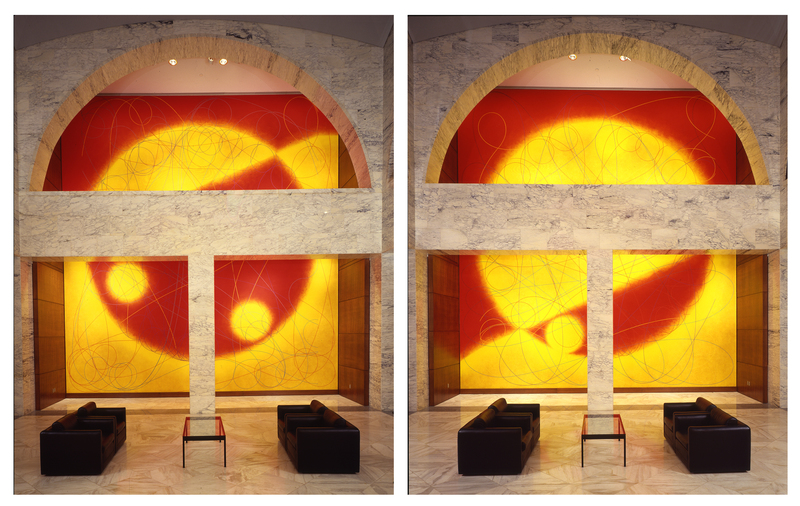 What’s happening to the monumental murals at the AT&T building? In the latest twist and turn in the saga of Philip Johnson’s notorious AT&T Building, the team from Norwegian design firm Snøhetta has released their plans to overhaul the base of the tower with a massive undulating glass façade that will override the monumental postmodern composition of the tower. 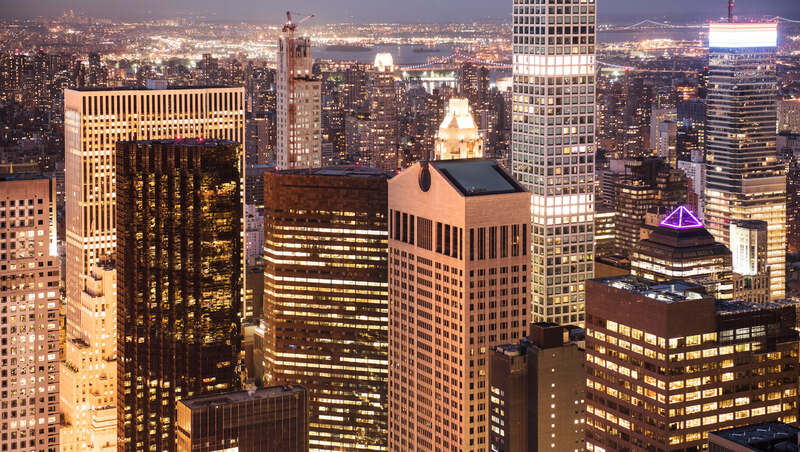 The 1980s tower, located at 550 Madison Avenue, is the first major project to be announced as part of the New York City’s East Midtown rezoning plan. 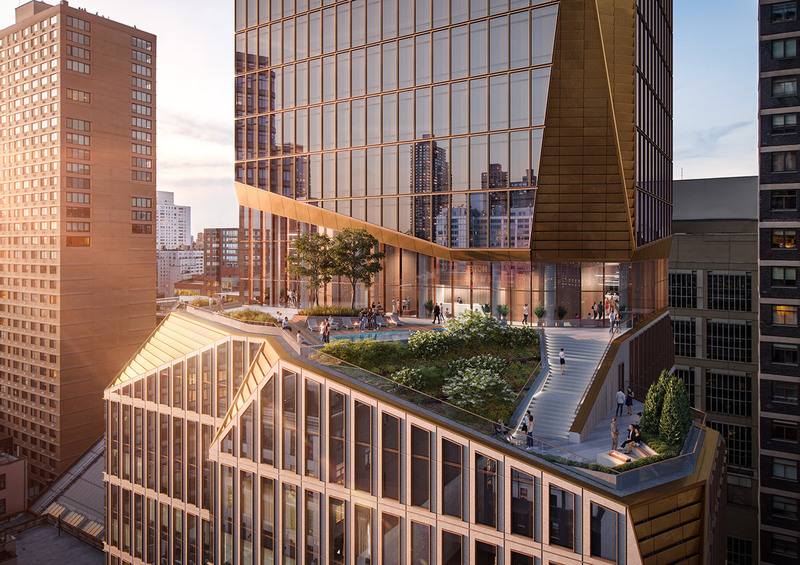 The work will focus on the public spaces at the street level, including a larger garden that will connect Madison Avenue and 55th Street as well as open up the brick façade and the retail and office spaces behind it. The Sony Corporation had owned the building since 2002 but left almost 2 years ago. It was bought in 2013 by the Chetrit Group and Clipper Realty, who had planned to turn it into luxury condos designed by Robert A.M. Stern. The plan was scrapped, however, when the firm started to second-guess the high-end residential market. Saudi Arabian investment group Olayan America bought the building for $1.4 billion and along with development partner Chelsfield America plans to turn it into offices. Snøhetta aims to “highlight the multi-story arched entry while revealing the craftsmanship of the building’s existing steel structure.” The first two levels will be publicly accessible. The garden will feature seasonal plantings that will be transformed over the course of the year and the owners hope that birds and butterflies will flourish in the new urban greenscape. Founded in 1947, Olayan America has its main offices in Athens, London, Riyadh and New York, where it is based and where it has had a continuous presence for more than 45 years. 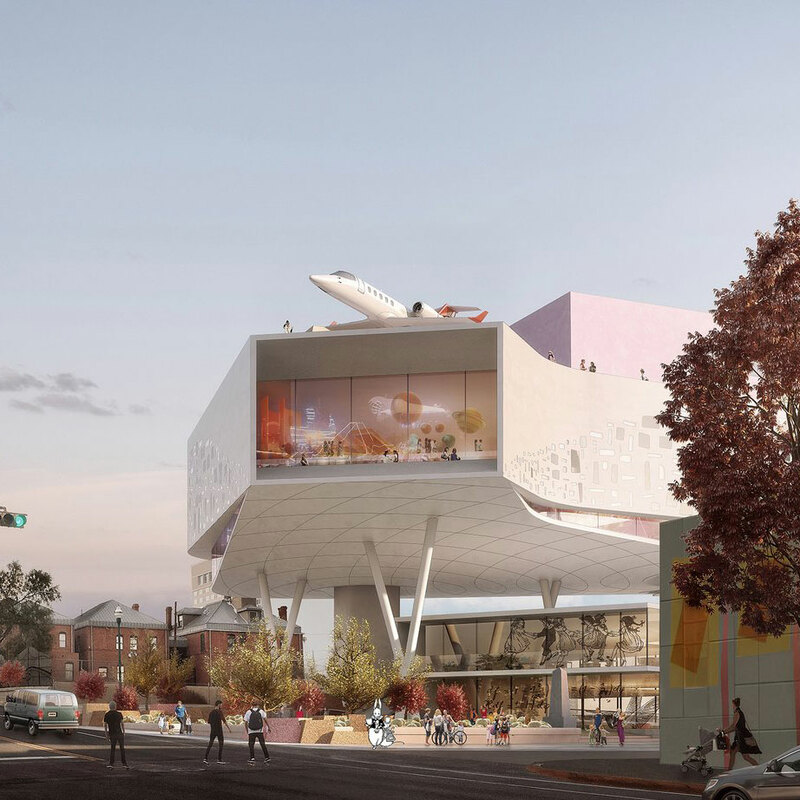 Read our followup here to see how architecture critics and others in the architecture community are weighing in on the proposed design.